Is the Cornell Nutrient Analysis Laboratory (CNAL) a certified laboratory? No, but CNAL does provide research quality data and is North American Proficiency Testing (NAPT) compliant. 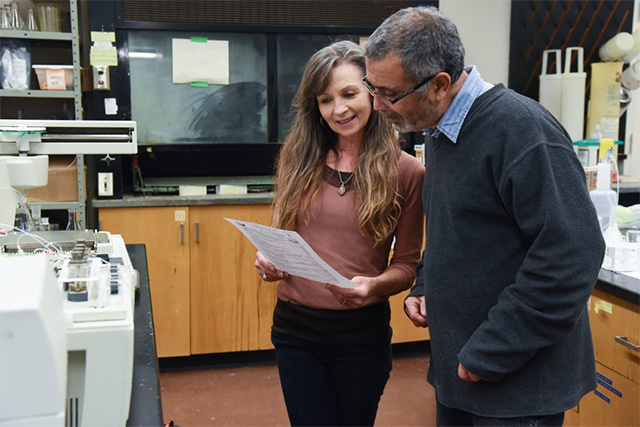 The NAPT Program (a program of the Soil Science Society of America) assists soil, plant and water testing laboratories in their performance through inter-laboratory sample exchanges and a statistical evaluation of the analytical data. Can results from CNAL be used for legal or regulatory purposes? The Cornell Nutrient Analysis Laboratory is not certified by the NYS Department of Health. Therefor results cannot be used for legal purposes. Does CNAL offer a rush service for results? We no longer accommodate rush requests. We run samples according to date received in fairness to clients who are currently awaiting results. Thank you in advance for your understanding. However, we provide results in 2-3 weeks from when we receive samples at our lab. Does Cornell offer fertilizer recommendations? No, CNAL does not offer recommendations. CNAL is strictly a research facility and although we analyze for the nutrient content in the soil, we don’t supply recommendations or interpretations on any specific data. Although you will be able to view a comparative table and some guidelines to follow, Agro One (part of Dairy One) , a company we partner with, supplies the analysis plus the Cornell research based fertilizer recommendations for your particular analysis if you request it. Please contact them at 1-800 344-2697 for information regarding this. You may also view their website at http://dairyone.com/analytical-services/agronomy-services/soil-testing/. Can CNAL test my soil for heavy metals? We often test for heavy metals, including lead. Please check the descriptions of our heavy metals tests (Form S, tests #2021) to ensure we can fulfill your needs. Keep in mind that you will not receive any recommendations or test result interpretations. Can international samples be shipped to and analyzed by your lab? CNAL has a USDA-APHIS 525-A permit to accept restricted soils from both international and domestic locations. Samples that arrive unannounced will be autoclaved and disposed of. International submissions are treated as quarantine samples, and are autoclaved after analysis. Quarantined soils are from any area outside the contiguous United States. Special shipping and lab procedures are required for quarantined soils. You must contact Robert Schindelbeck prior to shipping quarantined soils: rrs3@cornell.edu. Quarantined samples are subject to an additional 15% surcharge. How do you maintain quality assurance? In addition to our internal quality control checks, CNAL participates in the North American Proficiency Testing (NAPT) program. This program is managed by the Soil Science Society of America and assists soil, plant and water testing laboratories in their performance through inter-laboratory sample exchanges and a statistical evaluation of the analytical data. Can you provide me with a citation for your methods? Many of our methods are listed on the Analyses page of our website. If you need a specific reference, please contact the lab director. What is the turn-around time for submitted samples? Turnaround time is 2-3 weeks for most tests. Due to the nature of the Particle Size analysis, it often takes between 4-6 weeks to complete. If you submit a large number of samples, or request a large number of tests, turn-around time might be longer. Do you accept checks and if so who do I write it out to? Yes, we prefer checks. Please make them payable to CNAL and mailed WITH the sample(s) and the filled out submission form to the address at the top of the submission form. All billing questions should be directed to Elizabeth Woodring . Does CNAL do customizable analysis? Yes, we regularly work with researchers and others to design customizable analyses. Please contact Dr. Rutzke with any questions or requests. How can I order bulk reagents for pH kits? You will need to contact a NYS CCE (Cornell Cooperative Extension) office near you and ask them for these indicator solutions. Usually they have the bulk reagents on hand and will sell them to you but if not they will need to contact us directly. We only sell the bulk reagents to the CCE offices due to certain regulations we abide by. Can you answer my general questions about compost? We recommend that you contact the Cornell Waste Management Institute. Does CNAL provide food testing (sugar, fat, carbs, protein, starch, calories, vitamins, etc.)? No, we analyze soil, water and plant tissue for nutrients (e.g. nitrogen, phosphorus, potassium, calcium, magnesium, sulfur and micronutrient elements), heavy metals, pH , organic matter, etc. We do not provide nutrient testing of this type but suggest that you contact NYSAES in Geneva NY (315-787-2011 or 2255) https://foodscience.cals.cornell.edu/about-us/facilities/geneva-facilities or visit the address below for further information. Does CNAL test for pesticides, herbicides or PCB’s? CNAL does not offer this sort of testing. You may want to contact the Adirondack Environmental Services in the Albany area. They can be reached at 1-800-848-4983 or online at http://www.adirondackenvironmental.com .